Check out the latest Harley Davidson Low Rider classifieds posted on GoGoCycles. We have quite a few used Harley Low Riders listed for sale by owner PLUS some Harley Wide Glides that might be just what you're looking for. Don't you want to see if you have been getting the screws put to you at the tire store? We are always interested in hearing from people who have ridden, owned and worked on these motorcycles. So, if you have some time on your hands it would be appreciated if you would take a few minutes and write a review of your experiences with the Harley Low Rider in your life. 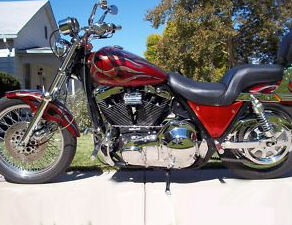 2008 HARLEY DAVIDSON WIDE GLIDE 105th annv. While you're here, you can tell us all about your adventures riding your Harley Wide Glide or Lowrider, advertise any used parts or accessories that somebody who is restoring their motorcycle might be interested in or just make a bid on one of the used Harley motorcycles for sale that you find here. We're a friendly bunch of bikers around here and don't have any rigid rules and regulations other than to ask that when you are filling out a classifed for a LowRider that you own that you please upload a picture of it whenever possible, post your asking price and give a detailed description including a general location of where the motorcycle can be seen and/or picked up after payment.